Cars have always had a huge influence on city planning. They have changed the look of cities in the past, and will do that in the future, too. About half a century ago, as car ownership in the Untied States started to increase, more and more people began moving to the suburbs, which helped reduce population density in city centers. 3 Driverless/Autonomous Vehicles Mainstream 20 Years From Now? 3.2 Americans Showing Less Interest In Driving? This meant that the traffic infrastructure in cities had to be changed and they became less auto-oriented. But, in the past decade or so, the trend has changed and an increasing number of people have moved back to cities, and now, over half of the world’s population lives in urban areas. Now, as autonomous driving technology advances, the question is how driverless cars will affect the way cities look. Driverless/Autonomous Vehicles Mainstream 20 Years From Now? Driverless cars are expected to become mainstream within the next 15 – 20 years, and they will obviously improve traffic safety, reduce air pollution, as well as fuel consumption. These are the most significant benefits cities will get from cars that can drive themselves. On the other hand, they are expected to help encourage urban sprawl, or reshape cities as mentioned in a New Times article, which may have a negative environmental and economic impact. 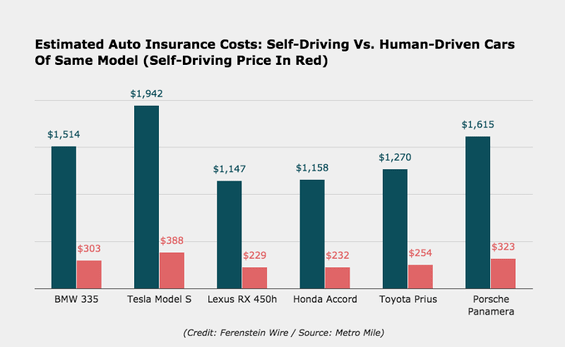 As illustrated by the graph there are big savings in auto insurance costs with autonomous vehicles. Americans Showing Less Interest In Driving? In recent years, less and less Americans have shown interest in owning and driving cars, and have been increasingly using public transportation or other alternative forms of transportation. *2016 Google transitioned to company Waymo a subsidiary of Alphabet. Today, a lot of people, especially the younger population, are choosing to live in city centers, where they can walk to work, or take the bus or ride the subway, in an effort to avoid frustrating traffic jams, road rage and contribute to reducing CO2 emissions. However, autonomous cars can turn out to be quite appealing to those who don’t like driving. These vehicles will be intelligent, able to park themselves, avoid collisions, as well as traffic congestion. They will also give you the opportunity to do some work, make phone calls, or simply relax while traveling, as you won’t have to keep your hands on the wheel at all times, and you’ll be able to use the time you spend in your car to do something more productive. That’s why people might start showing more interest in driving, which in turn, might motivate them to move to the suburbs. At the moment, commutes are pretty frustrating, making people spend hours and hours in their cars each and every day, stuck in traffic, which doesn’t leave them enough time to take care of all the other important stuff. If you have a self-driving car, your commute will be much more bearable, travel times will be reduced significantly, and you will be able to navigate through traffic more easily, so living in the suburbs will make more sense. With all this in mind, it’s highly likely that driverless cars are going to create urban sprawl all over again, which could lead to decreased use of public transport, but it will also probably result in more practical use of public spaces in cities.